Short Sweet Synopsis: Cadence Sinclair Easton, Cady, was in an accident that she can't remember, which has altered her life forever. No amount of her family's fortune can mend her brain; she will have to find a way to remember on her own, but will she be able to handle the truth? "We Were Liars" was a wonderful book; I read it in just a few sittings. I had to know what happened to Cady! What is Gat's issue? Why are Johnny and Mirren being so selfish? My brain was full of these questions and more. At first, I found E. Lockhart's writing style to be a bit confusing, but I got used to is pretty quickly. Cady's brain is broken, so how can you expect her narrative to be clear? I thought Lockhart did a wonderful job of showing us Cady's mental instability. 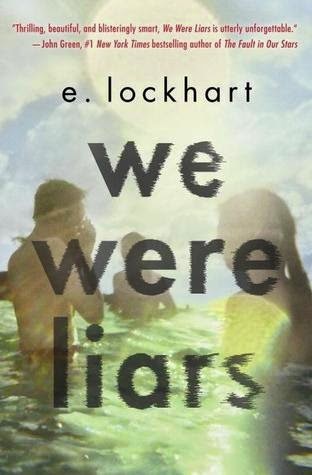 "We Were Liars" was not just about Cady's personal struggles; it was also about the family dynamic. Yes Cady's family has more money than I can imagine, but we learn that family expectations and pressures add conflicts that wear down on all its members. It was awful seeing how the family was, essentially, tearing themselves apart. By the end of the book I was completely shocked when all was revealed. I did not see any of it coming. I would never have guessed what the accident was! If I had taken time to stop reading and really think about what was happening, I guess I might have been able to figure out some of it. I was just so entranced with "We Were Liars" that there was no way I was going to put it down! I was truly caught up in this book and I think that, if you read the book with an open mind, you will too! I read this a while back and absolutely adored it. I loved the narrative style it was written in, and Lockhart's writing was beautiful. Glad you enjoyed!